Welcome to the IDEA Family! The student registration window for the 2019-2020 academic year will open on April 1, 2019. The first day of school is just around the corner, and we can’t wait for your child to attend IDEA! Our student registration window will open on April 1st. At that time, you can follow the steps below to begin the process online. Whether you start online, or complete the process at your campus event, the information you provide in this process will ensure we can provide all the necessary services your child will need throughout the school year, including food services, health services, special education, transportation, and extracurricular activities. In addition, we will answer any questions that you may have and collect important information from you. Need help or have questions along the way? Email registration@ideapublicschools.org, and someone will respond within 48 hours. Are you a returning IDEA family? Click here to re-register. Go to ideapublicshools.schoolmint.net. You should use the same login and password you used to accept your offer to IDEA Public Schools. If you have forgotten your password, please click the forgot password icon. From there, you will be able to set up a new password. Important note:If your username is a cell phone number, you will receive a text message to reset your password. If your username is an email address, you will receive an email to reset your password. Step Two - Click "Register"
Once you have successfully logged in to SchoolMint, click the orange "Register" button on the right-hand side of the screen next to your child’s name. When using a desktop or laptop computer, you will be asked to upload electronic files of your student’s scanned documents. Supported electronic files include JPEG, PNG or PDF. If you are unable to complete these forms online or have issues uploading your student’s files, please reach out to your campus to schedule time to go complete your student’s registration. Once you have filled out all the registration forms and uploaded all required documents, click “Submit Forms” at the bottom of the webpage to complete the registration process. Your next step is to attend Welcome to IDEA in person at your child’s campus. Your campus will reach out to you via email, text message, and/or mail with details about the date, time, and location of this event. Welcome to our Team & Family! 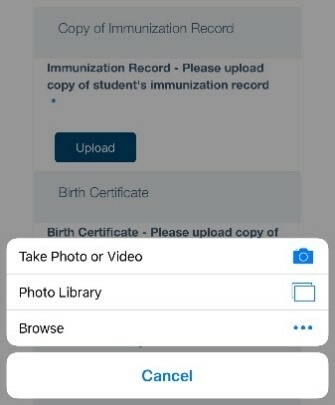 When using a mobile device with a camera, you can use your camera to take an image of your student’s documents. Click the upload icon and then select the option to use your camera. If you are unable to complete these forms online or have issues uploading your student’s files, please reach out to your campus to schedule time to complete your student’s registration. Need help or have questions along the way? Email registration@ideapublicschools.org, and someone will respond within 48 hours.